I mentioned after sharing my Lasagna Soup, that I rarely post food related post and here I am again with a food related post. However, I just had to share this one more! So, today I am sharing the best beverage you’ll ever have, a Cucumber Mint Moscow Mule. Over the holiday, my mama gave me four Copper Mugs for Christmas and I was so in love. My brother in law, B Rigg, became our mixologist and I was quite thrilled when he handed over this tasty drink in my new copper mug. It’s everything I love in a light refreshing (alcoholic) beverage. I honestly decided to grow cucumbers and mint in the garden this next year, JUST so I can have all the ingredients at a moment’s notice. Love! Featured on Our Favorite Things Pinterest Party this month. Thank you for pinning with us! Oh thank you so much, Denise for the feature!! I love your parties. Wow Amy! 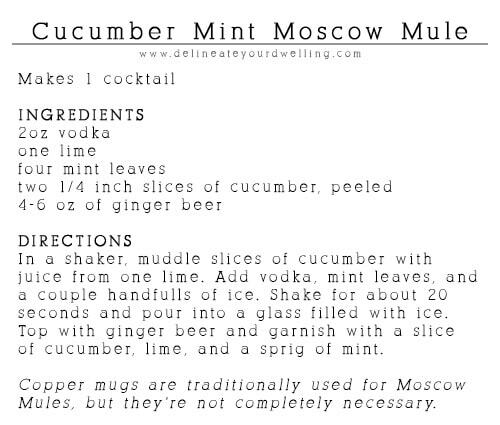 I’ve never had a Moscow Mule, but I keep hearing about them everywhere – definitely going to have to try this – I’ve got a huge crop of cucumbers ripe, and my mint is taking over the garden – so I’m definitely prepared!! Oh, you’ve got everything you need right in the garden… this weekend it’s time for a Moscow Mule!!! Apparently now all I need is a shaker and ginger beer. I have 92%of the recipe already. Must try. Ok I need to try this stat. Featuring it Monday at YDTT. Hope you have a fabulous weekend! I’m having some girlfriends over tonight and Moscow Mules are on our drink list! Ha. Stopping by from Lambert’s Lately. I have been looking for a Moscow Mule recipe- my husband loves them. Can’t wait to try this! Well then you will LOVE this recipe, it’s so tasty!! I just had another one over the weekend… yum. Ah friend, you made me smile. Thanks for all the love. Moscow Mules are my all time favorite drink! I’d love for you to stop by and link up with me at Talented Tuesday, 1 party 5 blogs, every Tuesday at 9am central! Ohh… I have not had a Dark and Stormy, but now I think I need one! 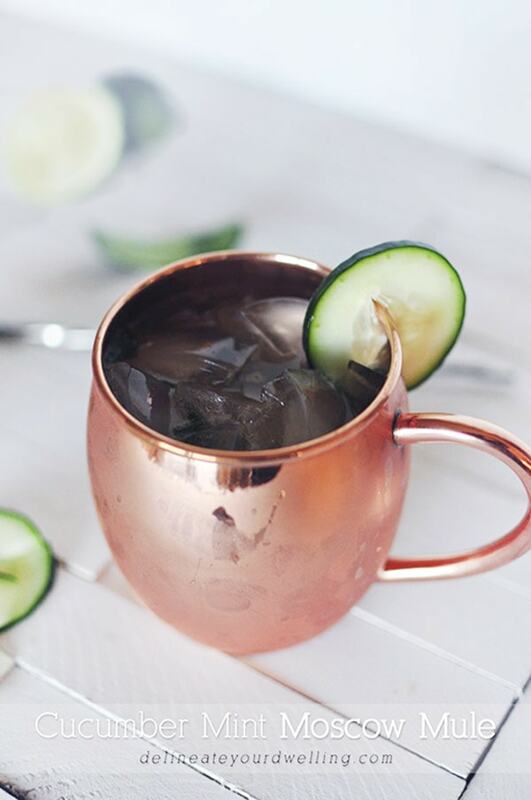 I’m new to Moscow Mules but now I’m obsessed! Thanks for following, I’m heading to check out your site! Yummy! I NEED to get me some of those copper mugs. They are just so amazing and stylish! I kind of want to start drinking ALL my drinks in copper mugs now, hee hee! I have always wanted to try a moscow mule. I’ve never had one. A lot of people say they love them and I actually never even heard of them until recently. But who doesn’t want to try it when they have those cute mugs! Pinning. I would love if you linked this up to Totally Terrific Tuesdays. Thanks for sharing.